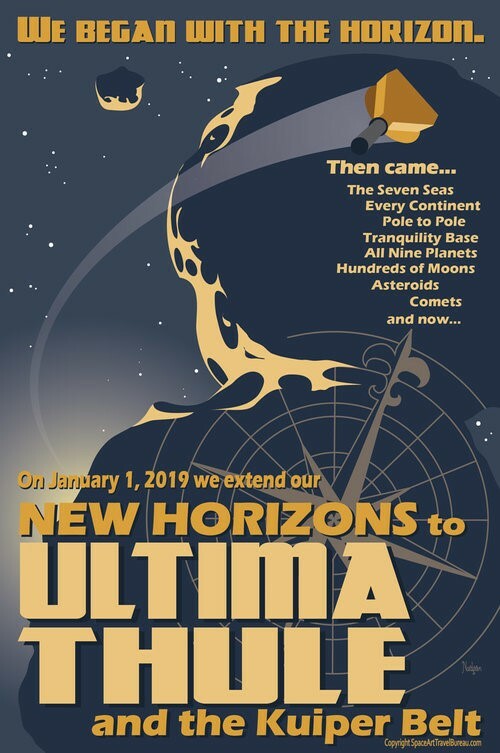 The New Horizons spacecraft is getting closer and closer to Ultima Thule. The journey began in 2006. Watch the images as they come in on New Years Day. 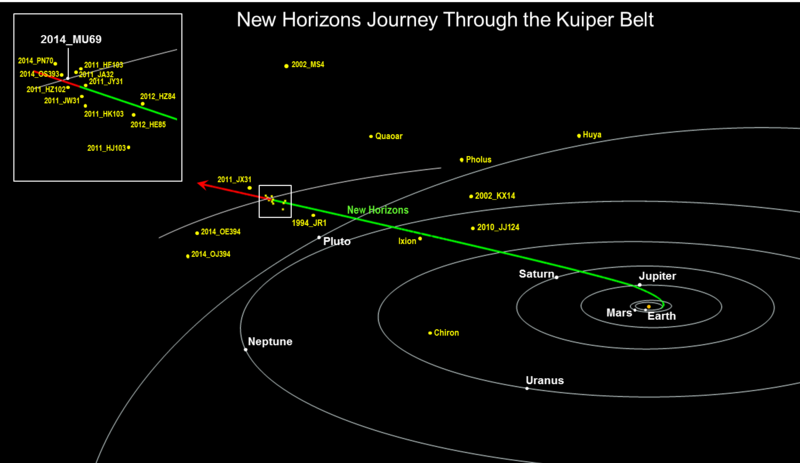 After the encounter with 2014_MU69 Ultima Thule, New Horizons will hopefully pass near another Kuiper Belt Object. The spacecraft's radioisotope thermoelectric generator is expected to provide power until the mid-2030s, so maybe NASA can keep NH operating long enough to reach interstellar space like the Voyager probes have done and make additional scientific observations there. At that point, it would be cool if NH can turn its camera back at our solar system and take another "Family Portrait" like Voyager 1 did back in 1990. Here's a video about New Horizons. Last edited by Nikola Bijeliti; December 26th, 2018 at 09:56 AM. Reason: Link to viewing schedule added. 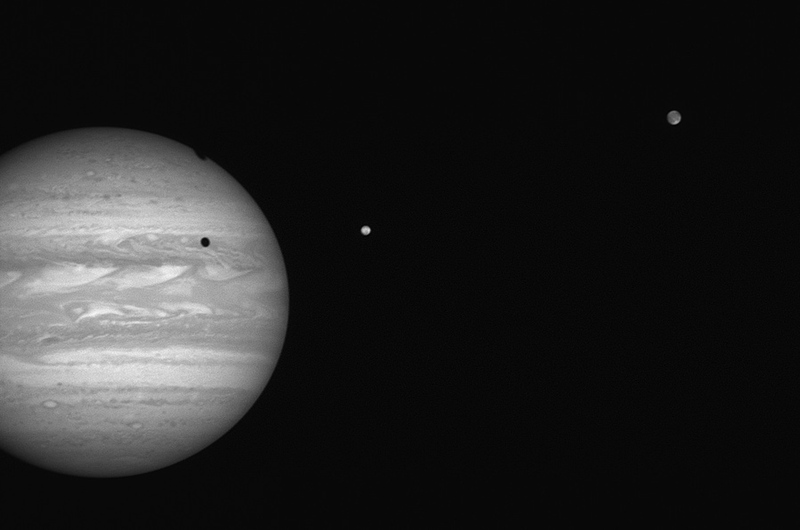 The PI's Perspective: Anticipation on Ultima's Doorstep! The highest resolution imagery we are attempting—an eye-popping 35 meters (about 115 feet) per pixel—is a stretch goal, requiring us to know exactly where both Ultima and New Horizons are as they pass one another at over 32,000 mph in the darkness of the Kuiper Belt. (And by the way, out there the Sun is only about as bright as a full moon on Earth, so Ultima is only very, very faintly lit). If we succeed at this observation, we'll have far better imaging resolution of Ultima than we got at Pluto (where best resolution was 70-80 meters, or 230-260 feet, per pixel). If we don't, other imaging observations will still exceed most of the Pluto imaging. And while we don't want to fail, you should know that that these stretch-goal observations are risky. But with risk comes reward, and we would rather try than not try to get these, and that is what we will do. Perhaps we will get real lucky and NH will find Planet Nine. Successful flyby of Ultima Thule achieved. NH phoned home to confirm its status. Pictures to follow later being it takes radio signals travelling at the speed of light over 6 hours to reach Earth from the probe's distance of over 4 billion miles. Incidentally, today marks the 60th anniversary of the launch of the Soviet Lunik (Luna)-1, the world's first interplanetary probe, and the first to escape Earth's gravity and become an artificial satellite of the Sun. Intended to hit the Moon, Luna-1 missed the Moon by 3,500 miles due to a programming error in its rocket booster. And here we are today with New Horizons at the edge of the Solar System on its way to the stars. 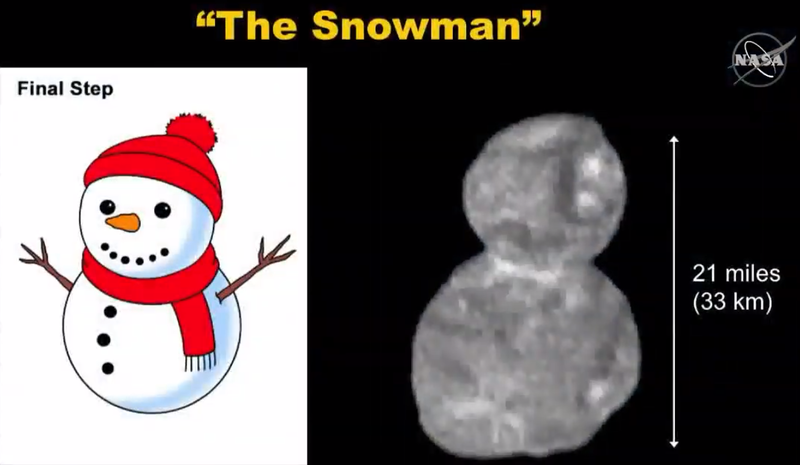 It's a "contact binary"--two circular lobes that formed separately, then over time merged, forming the snowman shape. Reddish in color due to volatile ices called tholins. Better images will be coming in as NH continues transmitting its data. Is it just me, or does that snowman have an Adolf Hitler mustache? Every year we make a snowman, but this year we decided to do something different, so we made a snow Kuiper belt object. In the Space: 1999 episode 'Death's other Dominion' Moonbase Alpha encountered a frozen planet called Ultima Thule. 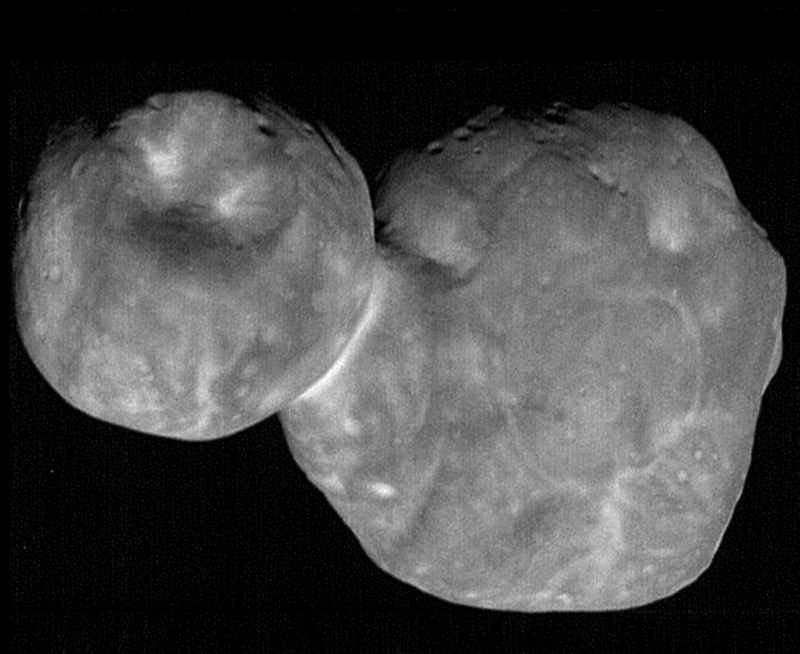 The real Ultima Thule isn't exactly that, of course. Maybe it could be nicknamed Frosty the Snowman. Here are the latest images from New Horizon. 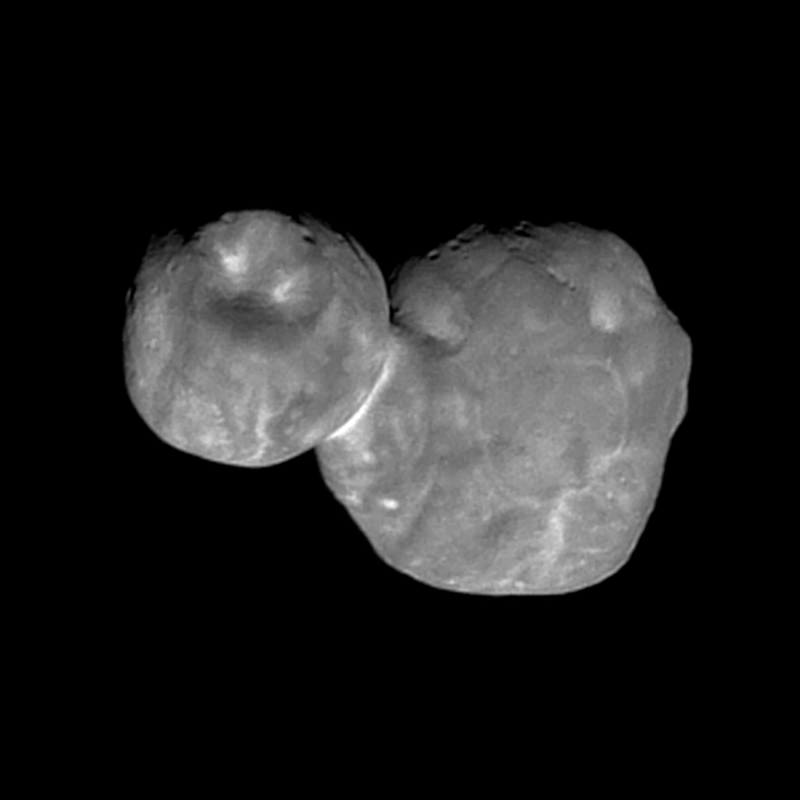 Recently transmitted images taken when New Horizons was departing Ultima Thule show that the two lobes are not as spherical as first thought. Notice the position of the stars in these images. Page generated in 0.14322 seconds.